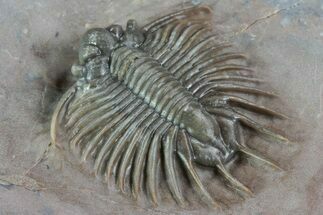 This is a scarce Devonian trilobite from Jorf, Morocco. 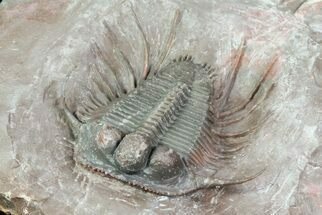 There have been a limited number of these trilobites on the market over the past few years and this is one of the better ones I've seen. 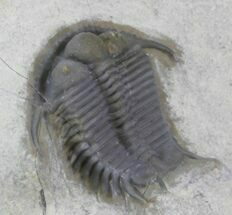 The light, glass-like shell preservation of the trilobites at this Jorf locality is very distinctive. 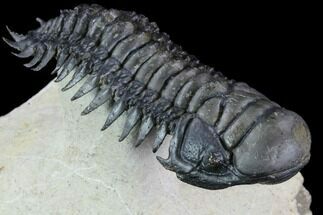 It would be a little over an inch long if fully outstretch and features a bulbous and granulosely textured head, small stalk eyes and elegant spines. 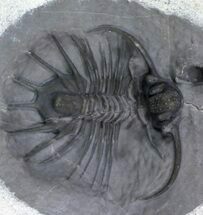 I did the finishing preparation work on this specimen. 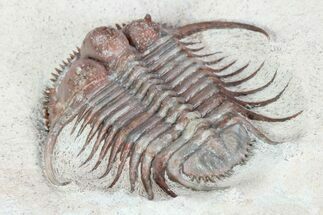 There is a repaired crack, but there has been no restoration work done.